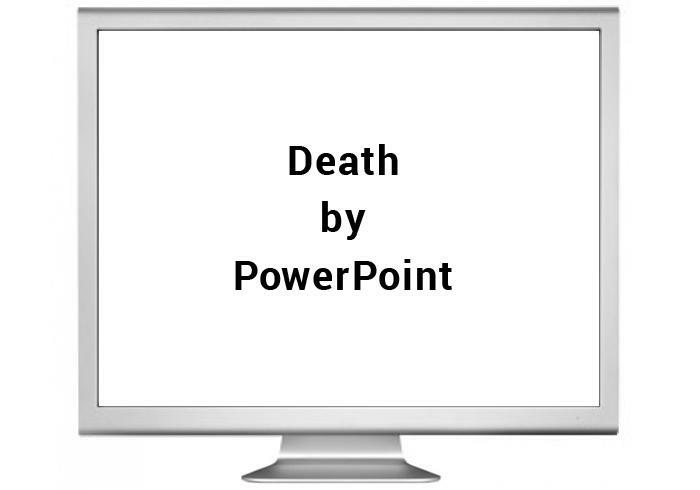 We’ve all experienced — and inflicted — the condition known as Death by PowerPoint. But there is a cure: Mix neuroscience with design with education theory and practice. Jared Horvath’s academic passion is translating the knowledge of neuroscience to enhance classroom teaching and learning. He has taught in US schools and is a researcher at Melbourne Graduate School of Education. He’ s now researching the impact of digital technology on learning, looking at effective combinations of text, audio and visuals. We intuitively know we need to see it, hear it, feel it, do it, think it and share it to learn it. Mr Horvath has combed education, neuroscience and design literature to compile strategies to help people improve the PowerPoint presentation. Fact 1: Neuroscience shows people can’t actually read and listen at the same time. Listening and reading activates similar areas of the brain and the voices compete. “A pivotal study using functional MRI brain scans showed the activation of the linguistic areas of brain for both listening and reading,’’ Mr Horvath says. Even though you may think you can read and listen at the same time, what’s actually happening is you are flipping quickly between one and the other. The two narrative voices are competing; it’s disjointed white noise and it’s soporific. “It’s called the redundancy principle and it’s unnecessarily mentally taxing,” Mr Horvath says. ... and try this instead. Fact 2: Neuroscience shows that images are more digestible and memorable. A picture tells 1000 words, but verbal reinforcement of pictures is more memorable. 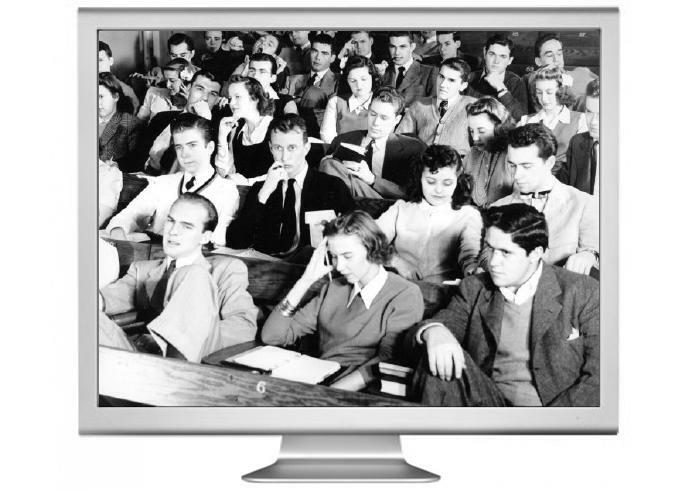 “Several studies have tested the impact of speech, images, and speech + images in active classrooms. “What they consistently find is that when information is presented orally with relevant images, student learning and memory is better than when the same information is presented only orally, or only in pictures. 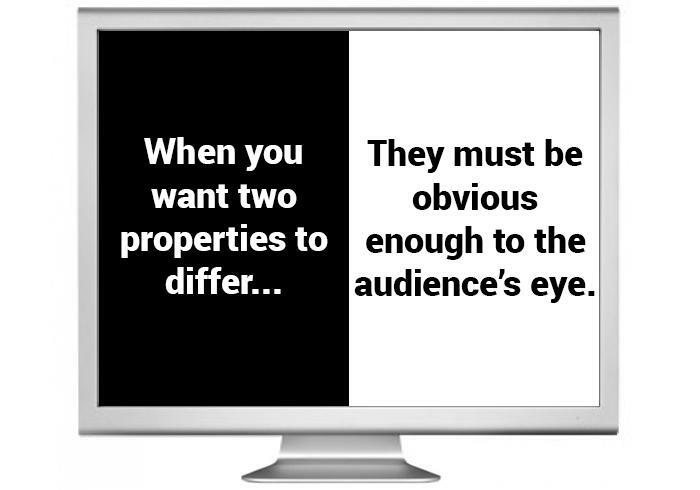 Images should be relevant and easy to decipher and interpret and not be covered with words. .... like a picture can. Fact 3: Neuroscience shows colours matter. Colour blindness is a common condition. Around 1 in 12 males and 1 in 200 females see the world slightly differently. 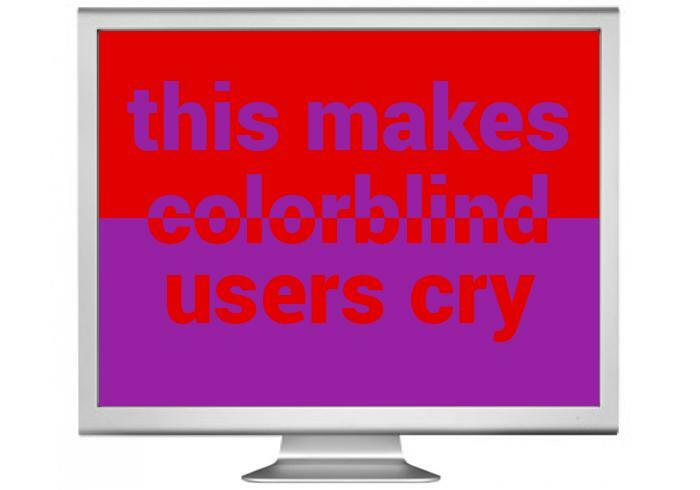 “There is a spectrum of colour blindness that carries the level of red or blue or green perception. Whilst we may not know our colleagues’ specific types of visual capabilities, it’s best to keep high contrast. There are many websites that can help decide what works best on screen and on paper,” Mr Horvath says. Fact 4: Neuroscience suggests, as do real estate agents, that ‘position’ matters. “There are many studies that have tracked where our eye travels on paper pages and on the screen. 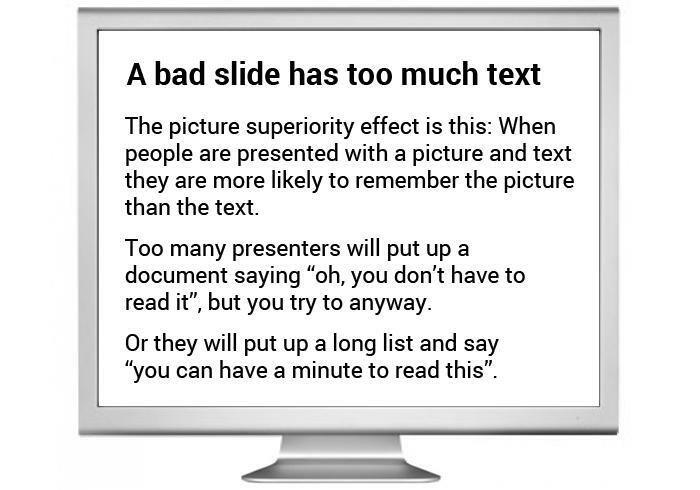 But the key is choosing a layout and keeping it consistent on your slides. 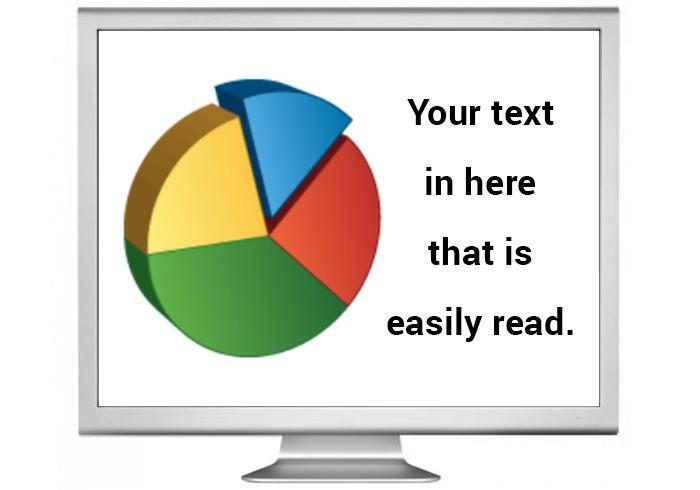 “The audience then knows immediately where to focus on texts and images. Psychologists call it contextual cueing. ... layout really helps communicate. Fact 5: Neuroscience suggests our attention spans are varied but our brains love a good story. Comedians have always known holding the audience’s attention and great delivery is all about … timing. An adult’s attention span is difficult to measure as it varies enormously, according to health, age, fatigue, interest and distractions. “Whilst sound and vision in presentations need to be in sync, you also need to be aware of pace and timing,” Mr Horvath says. Q & A or a story. “A good video or a story works because our brains love narratives, we are constantly trying to find cause and effect relationship and weave information into a coherent tale with a beginning, middle and end. 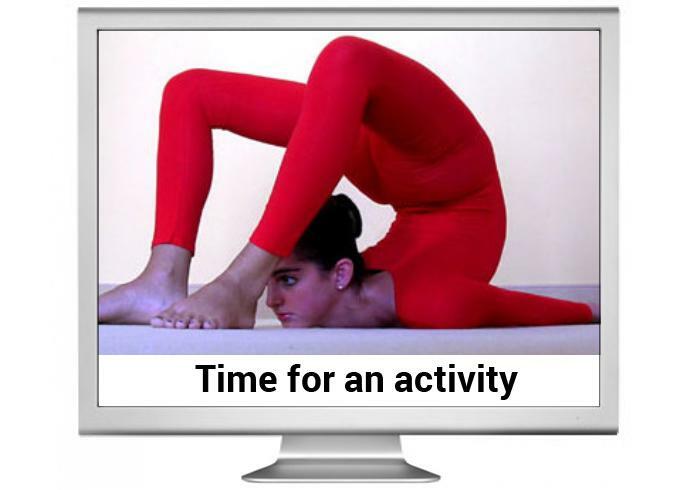 Change the pace, take a break ... you can even get the audience to try yoga. 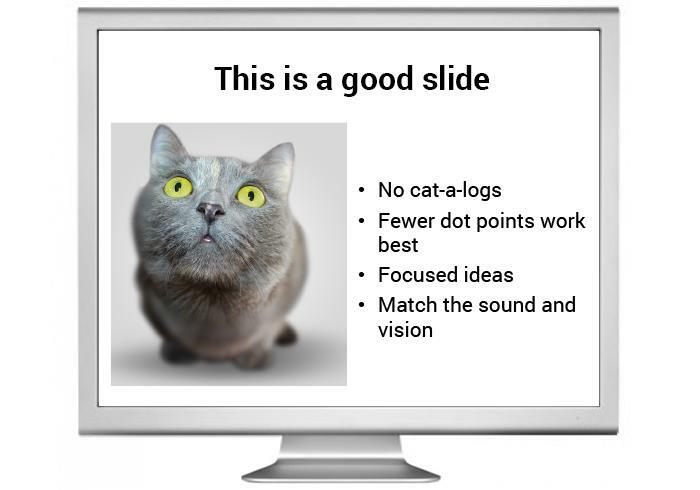 “There is no right answer to how many slides you should use; some of the best presentations have used very few slides, whilst others have hundreds (although, their slides are usually word free and visually support the oral content). Should the room be dark or light? And what time of the day is better for your presentation? Mr Horvath says the evidence for lighting levels swings both ways. 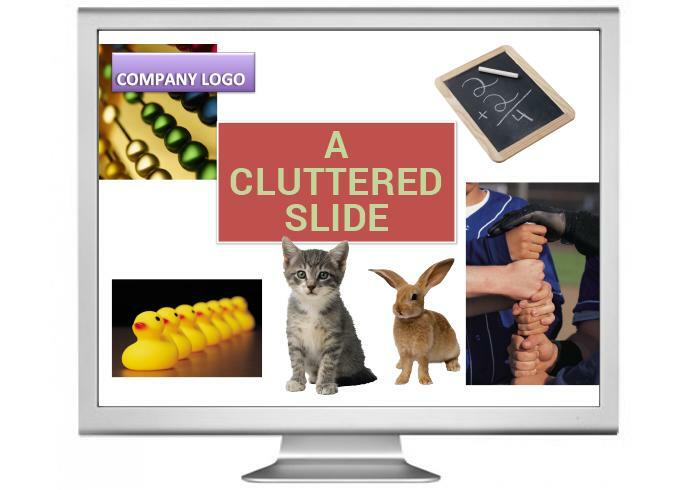 “But if your presentation is engaging and interactive, the lighting is likely to be unimportant. However, if the presentation is largely oral with little engagement or activity, then a bright room is more likely to stave off fatigue,” he says. “Alertness levels can also be about the individual’s level of sleep deprivation and health. Afternoon drowsiness or the 3pm slump is a universal phenomena. It’s due to a dip in blood sugar levels as insulin does its work, but it’s also due to a small drop in temperature, which is part of our normal circadian rhythm. So, you understand the brain … now what? How can we apply knowledge about the brain to improve teaching and learning in the classroom?